Almost exactly one year ago, the world met Hua Hua and Zhong Zhong, the first primates cloned through a technique that could theoretically produce an unlimited number of replicas. Now, a team of Chinese scientists has used the same technique to produce five clones of another monkey, one genetically altered to have a disorder with an array of traumatic psychological side effects — and the research is a horrifying ethical minefield. The technique used to clone the monkeys is called somatic cell nuclear transfer, and it involves replacing the nucleus of a donor egg with one removed from the cell of another animal. With Hua Hua and Zhong Zhong, scientists retrieved their donor nucleus from the cells of fetal macaques. This time, though, researchers from the Chinese Academy of Sciences used the nucleus of cells from a genetically altered monkey. Specifically, they used CRISPR-Cas9 to alter the animal’s BMAL1 gene, which helps manage certain circadian rhythms in some mammals, while it was still an embryo. According to the researchers’ two papers, both published in the journal National Science Review, the procedure worked. The five newborn monkeys exhibited a “wide-range of circadian disorder phenotypes,” including reduced sleep, increased movement at night, schizophrenia-like behaviors, and signs of anxiety and depression — all of which are on display in a disturbing video released alongside the research. While the idea of purposely subjecting animals to the psychological stresses described above is troubling, the researchers believe the potential benefits to humanity are worth it. There’s also the possibility that cloning genetically altered animals could actually reduce the number needed for research. “Without the interference of genetic background, a much smaller number of cloned monkeys carrying disease phenotypes may be sufficient for pre-clinical tests of the efficacy of therapeutics,” researcher Mu-ming Poo said in the press release. At the same time, the research raises a host of ethical issues. 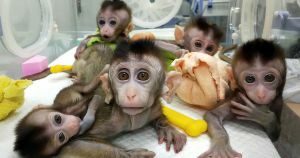 For one thing, there’s the large number of unsuccessful attempts that preceded the births of these five monkeys to consider — 65 surrogate mothers underwent embryo implantations, resulting in 16 pregnancies but only five births. Then there’s the lingering question of whether any insights gleaned from the research would even translate to humans — many animals studies don’t. More on cloned monkeys: Scientists Just Cloned Monkeys. Humans Could Be Next.